The Mission of the Bradford Landmark Society is to promote interest in the history of the Tuna Valley by acquiring and preserving artifacts and by presenting its heritage. Our door is always open. Won't you come in, relax, and spend some time with us? We love company. Your visit can begin with a Time Capsule - there are over 30 covering a wide range of subjects. Military aficianados will want to check out the Civil War Database. Just who came to Bradford first? Our First Families of the Tuna Valley will have the answers. The 1935-1995 Obituary Index serves as an aid to those of you tracing the branches of your family tree. Calendar of Events Check back often! Remembering those who've passed away. Histories of the Crook Farm and The Herbig Bakery answer many questions we've been asked about who we are and what we do. While you're here, please check out The Inkwell-Society Newsletter. This quarterly publication covers a wide variety of subjects and is sure to stir up some old memories. 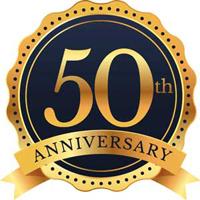 In addition to the First Families of the Tuna Valley and the Obituary Index, the Research & Reference Information section lists the collections, volumes and related sites we have available to assist you in your historical and genealogical searches. Historical Photos & Postcards represents only a portion of our photo collection. Enjoy dancing like it used to be or just kicking back and listening to some old time music? You've come to the right place. We sincerely hope you enjoy your visit. Please stay as long as you want and come back often. The City of Bradford is situated a mile and a half south of the northern line of Bradford Township. Bradford Township is in the northern part of McKean County. McKean County is in the northwestern part of Pennsylvania, bordering on Cattaraugus and Alleghany (sic) Counties, State of New York. The city lies in a valley. The east and west branches of the Tuna Creek converge at this point, and flowing in a northerly direction, enter the Alleghany (sic) River near Carrolton. Huge hills partially covered with forest growth line the valley on both sides from Bradford to the State line. The highest of those hills, Mount Raub, a mile east of Bradford, is 2,225 feet above sea level. From that point there is a gradual downward slope to the state line, at which place it is only 1,415 feet above the sea. Valley and creek derive their names from Indian sources. A large eddy at the mouth of the creek was called Ichunuagwant in the Indian language. A liberal translation of this tongue-twisting cognomen is “Big Cove with large Mouth.” A slight modification and we have Tunungwant (Crooked Creek) or Tuna for short. - Illustrated History of Bradford McKean County, PA., Burk Brothers, Bradford, PA., 1901. The name Bradford has come down to the city in logical if not inevitable historic sequence; first as the name of the township in 1827; forty-five years later, in 1872, as the name of the borough, and seven years later, in 1879, as the name of the city, both the city and the borough being a part of the original township. Prior to 1827 the settlement of the valley was between Kendall Creek and the saw mills at or near State Line, otherwise called Tuna. For some years the settlers of this mill district had felt the need of the advantages of a separate township. But under the law the courts for the county were held at Williamsport. 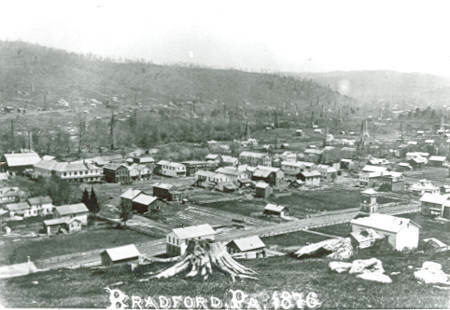 As soon as the courts were opened at Smethport, John F. Melvin, one of the mill proprietors, presented a petition bearing the signature of himself and fifteen others, asking for a division of Ceres Township and that the west end be set off in a separate township to be called Bradford. Melvin’s Mills was a New Hampshire village from which Melvin had come and it was situated in the town of Bradford. The sixteen signatures to the petition probably constitute the population of the valley at that time, and the list is therefore interesting as a registry of the pioneer residents. A facsimile of the petition is printed in connection herewith. The population increased slowly. Fourteen years elapsed before Mr. Melvin applied for the establishment of a post office. There was another name which he held in esteem. It was the name of Amos Kendall, Postmaster General from 1835 until 1840, and the master spirit of Jackson’s administration. The ancestral seat of the Melvin family was in Dunstable, New Hampshire, and it was the birthplace and home of Amos Kendall. The country was ringing in praise of this distinguished statesman when John F. Melvin asked that his name be given to the first post office. For the reason doubtless that so many offices had already been thus honored it was necessary to distinguish this one and the distinguishing word was suggested by the brook, and so the post office as well as the stream took the name of Kendall Creek. Nathaniel Edson was the first postmaster, the first office was at the Melvin homestead. It was moved to the Fuller House, which stood at the northwest corner of East Main Street and North Kendall Avenue. About 1837 Col. Levitt C. Little came with his two step-sons, P.L. Webster and C.D. Webster, and established himself at the forks of the Tununguant in the log-house which had been built by Dr. W.M. Bennett, somewhere about No. 21 Boylston Street, as the agent of the United States Land Company. About the agency a little settlement gathered and began to be known as Littleton and interchangeably Littleville. Daniel Kingsbury, who was a stockholder of the Land Company, made a purchase from it in 1851, of an area of 60,000 acres in and around Bradford. He came to Bradford, established headquarters, offices and bank, and proceeded vigorously to develop this immense tract. The growth of his business and increase of population at this new center made it imperative for him to have postal facilities, and the office was accordingly moved in 1854 from the Fuller House to the Old Red Store, and the name necessarily changed. The name Kendall Creek could no longer be appropriately continued, nor could the name Littleton be taken without discrimination if not offense against Melvin and the settlers of the East End. The population to be served was not alone that of Littleton, but that of Tarport or Kendall Creek as well, in fact of the whole township, and so the office was given the name familiar to the people chosen for the township by its pioneer citizen. This served, of course, to settle the name upon the village and so the common name for the post office, township and village was Bradford. It does not appear that the name Littleton was considered. If it had been it would have been linked in confusion with Littleville, which was also used. The resulting muddle rendered the adoption of either name impractible. This confusion of names appeared in an election case determined in the Supreme Court. In 1870 Charles C. Melvin, son of John F. Melvin, and himself a leading citizen of the community, was a candidate for the office of County Treasurer, and was elected by an apparent majority of thirty-two votes. His election was contested by his opponent. Among the grounds of content it was alleged in the petition “That the place of holding the general election in the district of Bradford is fixed by law at the school-house in Littleville (see note below) and that the sheriff in his proclamation designated the school-house in ‘’Littleton’’ as the place for holding the election. Whereas the election . . . . was held at a place more than half a mile distant therefrom, to wit, at a school-house on the opposite side of the Tununguant creek to the place known as Littleton”. The Supreme Court held that the election in Bradford Township was consequently invalid (Melvin’s Case 68 Pa. 333). Such disclosure of confusion was not only a little discreditable to the community, but it was also calculated to confirm Bradford as the proper and logical name for the village. Consequently, in 1872, when it was determined to have the village made a borough, there was no other name thought of. There was no contrariety of opinion. Note: Act of March 5, 1841. Prior to that the voting was at the house of Leonard (Larned) S. Foster-Act April 23, 1829, P.L. 421. This list of Freeholders is not known to have been heretofore published in connection with the history of Bradford. Having been accepted by the court as veritable, it is presumably an approximately complete list of the heads of families in Bradford just prior to the opening of the oil field. The concluding lines of the petition and appended signatures are herewith presented in facsimile in the exact order in which they appear on the petition. Next to portraiture the autographic signature of these pioneer villagers represents them in a most characteristic way. Written by their own hands they become interesting mementos. The petition, bearing the approval of the Grand Jury, having been presented to the court, its decree was entered thereon December 19, 1872, creating the Borough of Bradford. These proceedings are of record in the Recorders Office in Miscellaneous Book D, at page 490. It followed that in its own name the Borough of Bradford was incorporated as a city in 1879. Your monetary gift helps us continue offering these services. All donations are sincerely appreciated and gratefully accepted.